I am LOVING Covergirl LineExact Liquid Liner lately (whoa alliteration)! It is a very fine felt-tipped liquid liner that makes application super easy. I have found that this works just as well as a high-end liquid liner but for half the cost! This product retails for around $8.00 at the drugstore, but I see sales almost every time I go so you can probably get it for less! Regardless, it is still cheaper than the high-end brands which go for $20.00 and up. 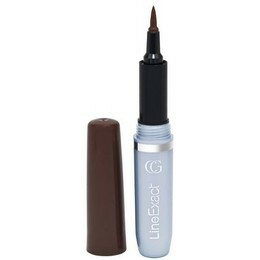 I bought this product in the Black Brown shade which is a nice alternative to black liner. I like to wear this with bronze eye shadow for more definition. This product will last all day even with oily eyelids! I think liquid liner is flattering on just about everyone so if you have yet to try it I highly recommend going out and picking up one of these Covergirl liners! Enjoy!